Today was my first day on the site, and I learnt an important lesson: if you know what you want your contractors to do, don't leave them to do it alone. Quite a few things were not as expected, despite detailed drawing and explanations. Thus the morning was a race to work around the missing bits. Most importantly, the electron inflow promised for Saturday had not been done, and thus a long trench was dug first thing in the morning. Fortunately, we had asked for spare tubing to be inserted in order to feed electricity out of the house for future buildings and lighting etc. These came in handy now, because they proved the only way to get electricity delivered in first place. A big "Thank You!" 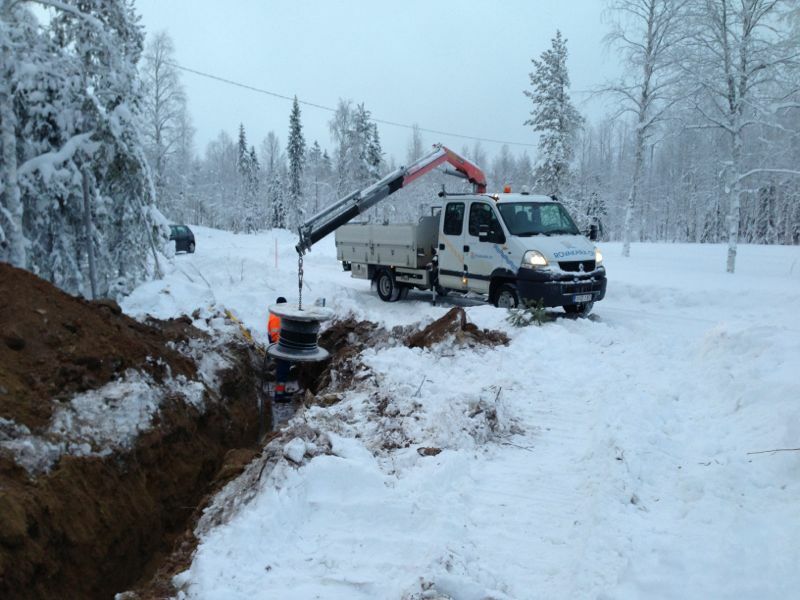 goes to the technical staff of Rovakaira Sodankylä, which – for the second time in a few days – changed their plan for the day instantly to respond to my calls for help. Well done! The photo shows them suspending a cable drum from a crane above the trench. 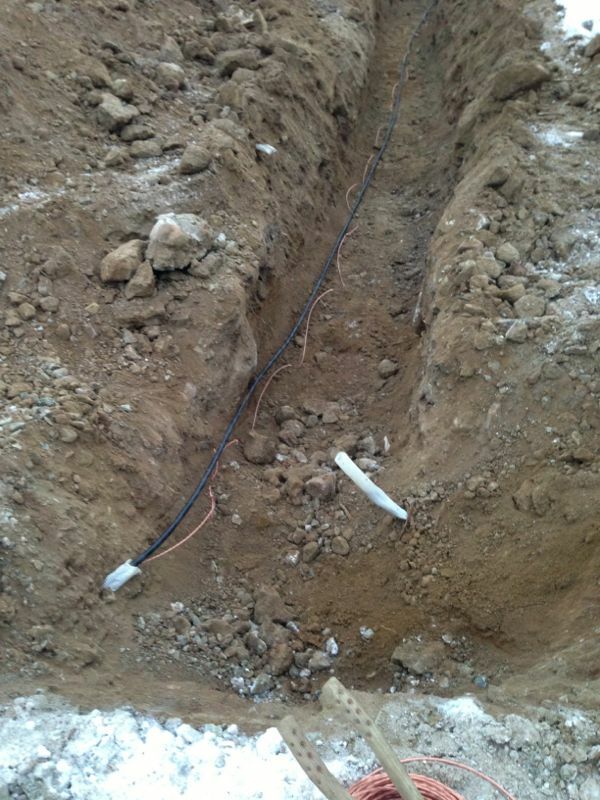 They then unrolled the cable from there as much as needed. The cable was then tied together with a copper grounding wire and pushed through my 50-mm white plastic tube into the area inside the foundations. The white tube on the right is a bit cut off accidentally by the digger – we had to rush, and there was no time for shovels, because the next work team had already arrived. 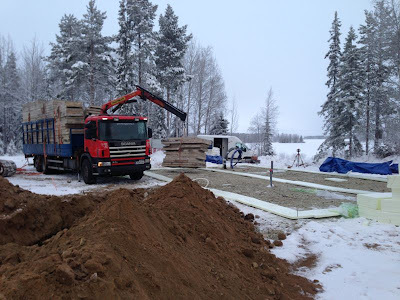 A lorry from Oulu brought all the bits and pieces to make the moulds for our foundations – and those of an identical house to be built elsewhere in Sodankylä soon after our's. 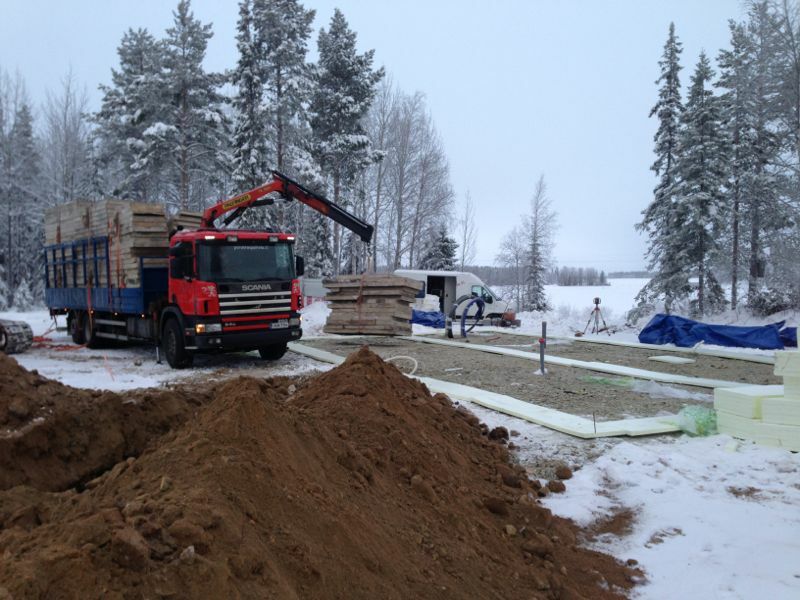 Here one can see the team unload the first pile of wooden walls, which will later form the moulds. Also visible is the FinnFoam, which has been spread out in the areas of the foundation walls. The foundation will be hollow, consisting of a rectangle and a wall longitudinally in the centre for extra support. The thing on the tripod in the distance isn't a camera (not yet! ), it's a laser levelling system. 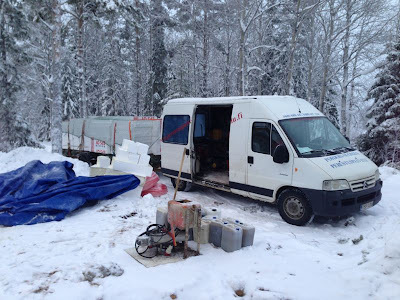 The final photo of today's blog entry is a picture of the van belonging to the other member of the two-person foundation work team, bringing extra equipment, and featuring a 220-V inverter and a microwave oven. More important for us is the machine in the foreground, and the canisters. This is the heating system, which allows for the concrete to dry our fast despite the cold. When the concrete will be poured in, pipes will be embedded in it, through which a special, heated liquid will be pumped. The machine in the picture is a pump and electrical heater combination. By heating the concrete, it will dry out in some 24 to 36 hours. Fortunately, the temperature was a rather pleasant -10°C all day with a thin cloud cover, but in the evening the sky cleared up and some stars were visible, so it might get cold. Tomorrow early morning, the concrete will arrive.